Captain John Smith is quoted to have said about the Chesapeake Bay that “Heaven and earth have never agreed better to frame a place for man’s habitation,” and many who live in the Chesapeake Bay region would agree. Flat land, good soils, and lots of waterfront property, all make this a great place to live. The Chesapeake Bay is surrounded by miles and miles of shoreline in Maryland and Virginia. To help you navigate, we’ve separated it into several areas. Chesapeake Bay region real estate companies are listed below under the areas that they serve. Please visit their websites for more information on regional properties. Chesapeake Bay Retirement Communities. Find independent living and continuing care retirement communities in the Chesapeake Bay region. Annapolis Condos by Bill Hyland. Reliable, up-to-the-minute information on the Annapolis Condo and Townhouse market. Prices, availability, location. Annapolis Luxury Properties. Specializing in luxury homes and estates in Annapolis, Severna Park, and the surrounding neighborhoods in Anne Arundel County. The McNelis Group. Southern Maryland listings, including Solomons and Chesapeake Beach. O’Brien Realty Southern Maryland exclusive waterfront real estate. Includes: Calvert, St. Mary’s & Charles Counties. Solomons, MD. Eastern Shore Real Estate Resources. Realtor with local knowledge of properties and waterways. Kent, Queen Anne’s and Talbot Counties. Chesapeake Bay Real Estate Plus, LLC – Located in St. Michaels, covers St. Michaels, Easton, and Tilghman areas. Janet Larson, Benson and Mangold Real Estate. Active listings, multiple list search, and links to local information sites. Coldwell Banker – Darlene Wheatley. Search Eastern Shore of Maryland listings. Easton Village on the Tred Avon. A new neighborhood designed in the tradition of the best small towns and waterfront villages found throughout the Eastern Shore. Lacaze Meredith Real Estate, Carolina Barksdale. Properties for sale in Talbot and Dorchester County. Re/Max Gold Realty, LLC. Listing and selling properties on the Eastern Shore of Maryland. Cowee & Cowee. MLS search results for Eastern Shore Real Estate in Talbot and surrounding midshore counties. Coldwell Banker Harbour Realty – This real estate company covers Virginia’s Eastern Shore, with offices in Accomac, Onancock, Chincoteague, and Cape Charles. Crockett Realty. Located in Onancock since 1992, offering waterfront homes, and farms and lots for sale on the Eastern Shore of Virginia. 39 Market Street, Onancock, VA 23417. Long and Foster Real Estate – Cape Charles office: 109 Mason Avenue. Bonnie Vest, Realtor: Long & Foster Realtors. Virginia’s lower Chesapeake Bay waterfront and inland properties for sale. Specializing on the Middle Peninsula and Northern Neck areas from the York River to the Potomac and everything in between. 17457 General Puller Hwy, Deltaville, VA 23043. Coldwell Banker Chesapeake Bay Properties. Middle Peninsula and Northern Neck of Virginia property listings. Edwards Bay & River Properties, LLC. Selling Virginia waterfront real estate & properties on the middle peninsulas of Mathews, Middlesex and Gloucester counties. Also serving the Northern Neck region of Lancaster & Northumberland. Specializing in the towns of Deltaville, Urbanna & Kilmarnock. 17355 General Puller Hwy, in the Heart of Deltaville, VA.
Jim & Pat Carter Real Estate. Detaville real estate office. Covers the Middle Peninsula and Northern Neck of Virginia. Neena Rodgers, IsaBell K. Horsley Real Estate, Ltd. Virginia’s Chesapeake Bay Region from the Potomac to the York Rivers, specializing in the Rappahannock, Corrotoman, Piankatank Rivers and Mobjack Bay and tributaries. Peggy O’Neill, IsaBell K. Horsley Real Estate, Ltd. Middlesex County real estate . 17229 Gen. Puller Highway, Deltaville, VA.
United Country Bay River Realty. Specializing in waterfront, and farms. Reedville, VA.
Chick’s Beach real estate listings – See homes for sale at Chick’s Beach, Virginia Beach’s bayfront beach community. East Beach, Norfolk. A community built on and around the water. With well-crafted homes on the Chesapeake Bay. Public greens along the beach. Marinas with deep water within walking distance. Pool at Bay Front Club. For those who love the water, this is the ultimate habitat. Fort Monroe Real Estate – Lease properties are available at Fort Monroe, the historic waterfront former military base in Hampton, VA. 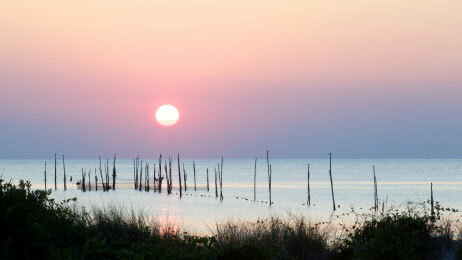 The Chesapeake Bay region of Maryland and Virginia is steadily growing, as more people discover this pleasant area. However, with this influx of people come threats to the region’s fragile ecosystem. There are things that homeowners can do to minimize their impact on the Bay. Please visit the links at the bottom of this page for more information on environmentally sensitive development and how you can help protect the Chesapeake Bay. We’ve provided realtor links for various regions around the Bay, as well as links to some particular developments that may be of interest to new home builders. Enjoy browsing all the wonderful property opportunities available in the Chesapeake Bay region! Information homeowners property-buyers in the Chesapeake Bay region. Chesapeake Bay preservation regulations, things you can do to help protect the Bay, and other useful information. Backyard Actions for a Cleaner Chesapeake Bay. Conservation tips from Maryland farmers. Includes a native plants list. Homeowner’s Guide to the Chesapeake Bay Resource Protection Areas. Published by the City of Virginia Beach but a good introduction for elsewhere in Virginia too. Things you can do – Ways to help protect the Bay. Maryland Real Estate Tax Rates – Tax rates by county. Consumer’s Guide to Buying and Selling Real Estate in Maryland – Tips from the Maryland Department of Labor, Licensing, and Regulation. Chesapeake Bay Preservation Act – Virginia legislation that regulates waterfront development in the Chesapeake Bay watershed. 12 Negotiating Tips Every Homebuyer Should Know – Tips from U.S. News and World Report.